Sciatica & Back Pain Self-Treatment Review: It's a SCAM! You are here: Home / Blog / Sciatica & Back Pain Self-Treatment Review: It’s a SCAM! Sciatica & Back Pain Self-Treatment Review: It’s a SCAM! 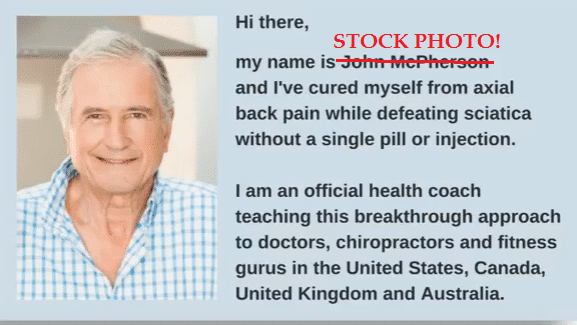 Sciatica & Back Pain Self-Treatment by ‘John McPherson’ is nothing but a laughable scam! I couldn’t help but chuckle while watching the scammer spew a lot of garbage in the video presentation…but now let me seriously give you the reasons why you should stay away from this product! One day, he stumbled upon a TV channel where he saw a group of Japanese ‘healers’ curing 10 people with various degrees of sciatica and back pain in 3 minutes live on air. Astonished by what he just saw, McPherson supposedly reached out to one of his Japanese friends, who gave him the contact info of the Japanese group’s spokesperson. After several calls, McPherson was able to reach the group, who mercifully gave him ‘a comprehensive description of their remarkable techniques.’ After applying the ‘techniques’ on himself, McPherson was able to get rid of ‘all the debilitating pain’ he had been suffering in just 5 days. 1. John McPherson Does NOT Exist! The amazing true-life story I just told above never happened because ‘John McPherson,’ the protagonist, does NOT exist! He is just a stock photo you can buy at Shutterstock.com. The aforementioned ‘breakthrough’ does not exist. The scammer took the deception further by showing photos of ‘McPherson’ on a wheelchair, his alleged family and him surfing. Actually, they are stock photos taken from Alamy, Dreamstime and Shutterstock respectively. The testimonials featured on Sciatica & Back Pain Self-Treatment are impossible to verify, since no photos or videos were included for confirming their authenticity. Now since the creator of this program does not exist, I’m very sure that the testimonials are fake. McPherson wants you to buy Sciatica & Back Pain Self-Treatment for $39. This price, he claims, is ‘completely voluntary.’ In other words, this product is actually free of charge, but you’re just donating $39 in appreciation. LOL! McPherson goes further to say that the ‘voluntary’ $39 is actually a ‘deposit,’ which he will refund to you ‘with a smile’ within 60 days ‘if you say the word.’ Give me a break! Final Conclusion: DON’T BUY Sciatica & Back Pain Treatment. It’s A SCAM! As you can see, this review is short as there is not much to say about this product. This is because its creator never tells us what this ancient Japanese method is and how it works. As I’ve said earlier in a previous review, sciatica pain that does not respond to pain meds can only be cured with surgery. Other causes of low back pain may be physical trauma or problems with kidneys and sometimes pancreas. So you need to see your doctor, who will examine you and pinpoint the exact cause of your problem. Only then can proper treatment be prescribed. Don’t be like this fake McPherson who has a phobia for doctors. Doctors don’t cause disease, they identify and cure them with the available resources at their disposal. Give them a chance to better your health. As always, feel free to comment if you have any contributions to make. Thank you!